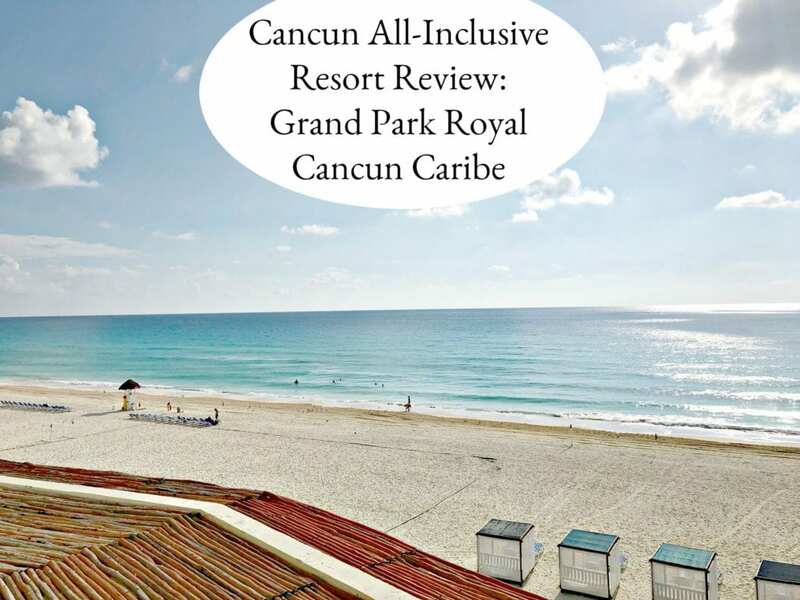 Inside: Thinking about booking a trip to the Grand Park Royal Cancun Caribe all-inclusive resort? Make sure you check out this in-depth review first. I am so excited to share this in-depth review on the Grand Park Royal Cancun Caribe resort in Mexico. My husband and I recently returned from our anniversary trip, and we had a great time. For some background on us, my husband and I got married in 2009. 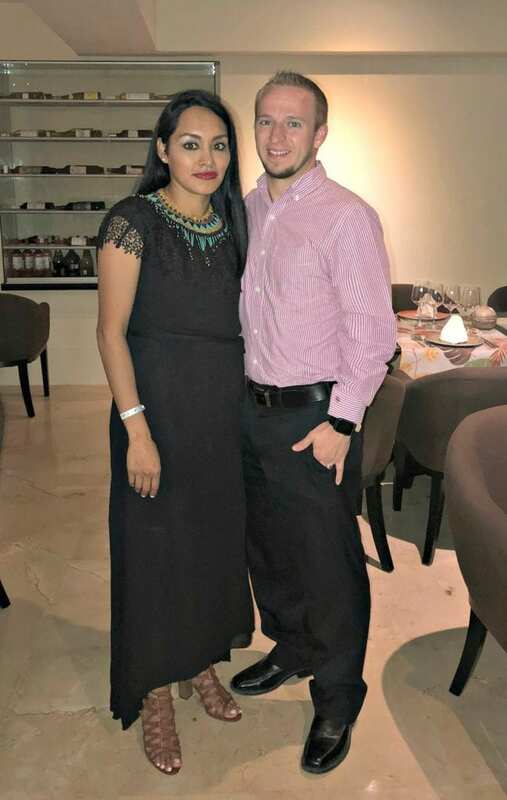 Right after we got married, we spent our honeymoon at a resort in Playa del Carmen, which is in the same general area as Cancun. After that, we had three kids and we hadn’t had the opportunity to go on any trips together as a couple. This year, we felt like the kids were old enough to stay with my mom, so we decided to book a trip to celebrate our 9th anniversary. We spent quite a bit of time researching different all-inclusive resorts in Cancun before eventually deciding on the Grand Park Royal Cancun Caribe Resort. In this blog post, I am going to provide an in-depth review of our experience. I will cover the below topics. For each topic, I will assign a score based on the total number of points for each topic. As you can see, some topics have a higher total point value, because in my opinion, they are more important to the overall experience. Please remember that this review is based mainly on our own experience. 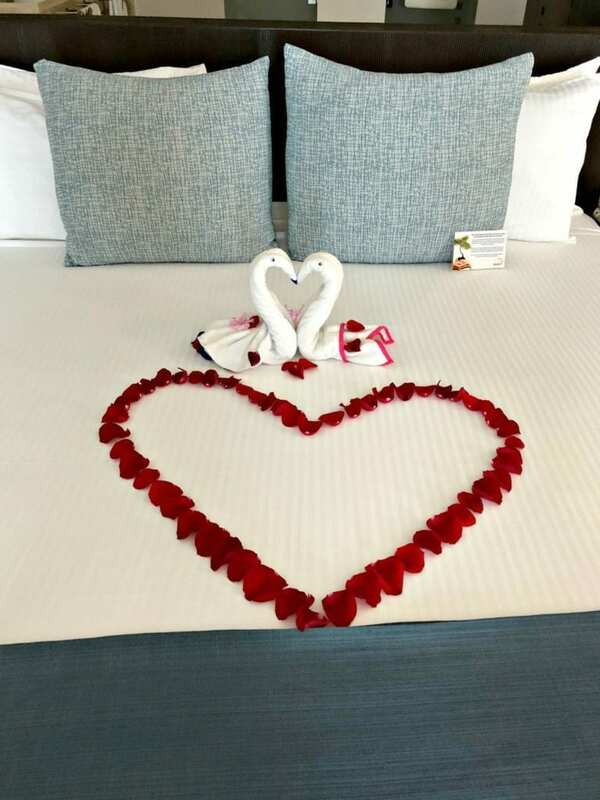 Obviously, we didn’t experience all of the different room options, and we weren’t even able to try all of the restaurants, but we did as much as we could and hope that this review is helpful for anyone considering a trip at the Grand Park Royal Cancun Caribe. We started our trip early in the morning, with an anticipated arrival time at the resort at about 5 pm local time. 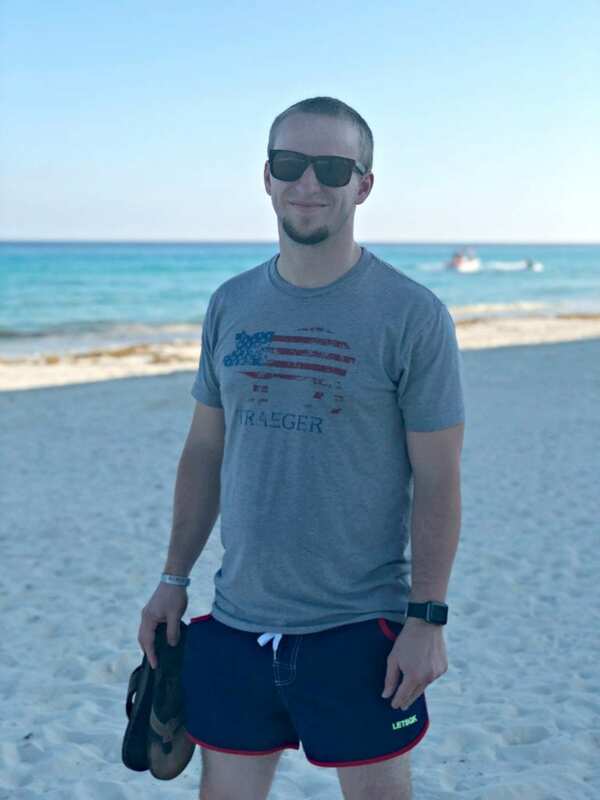 We contracted our airport to hotel transportation through Cancun Transportation, and it went very well. The driver was waiting for us upon arrival and the fees were very reasonable. We made it to the hotel right around 5:30 pm. 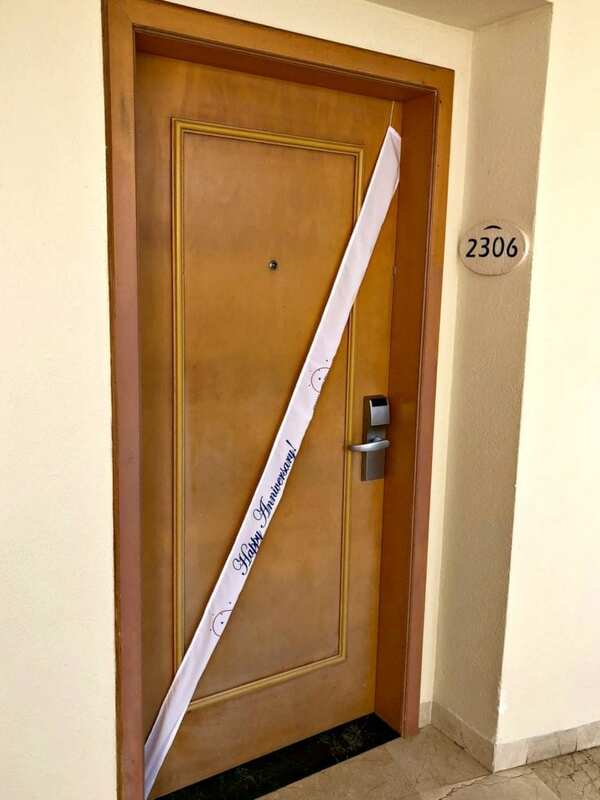 When we arrived, the bellhop put a tag on our bags and took them, telling us that they would be waiting for us at our room when we finished checking in. After that, we were ushered over to the check-in area. We thought that it would go quickly, because there were two people already being attended to by the staff, and we were next in line. Unfortunately, it didn’t go as quickly as we had envisioned. Keep in mind, at this point we were extremely tired from traveling all day and we just wanted to get to our room. For some reason, the two people in front of us had some issues that they were discussing, and it wasn’t our turn for at least 20 minutes. At this point, we were a bit frustrated, because there were many other desks open at reception and it looked like there were other staff members that could help us. Nevertheless, we waited and eventually it was our turn. The check-in itself was relatively painless. We asked right off the bat if there were any upgrades available. It took the staff member about 5-10 minutes to look it up on his computer, but eventually, he told us that he could upgrade us to the adult-only Royal Tower for $60.00 extra per night. For us, that turned out to be about $300.00 extra. We felt that the upgrade cost was a bit high, but we decided to go for it since it seemed like it would be worth it in the end. More on the room later. After we received our keys, we were introduced to a “concierge”, who was supposed to explain a little bit about the resort and get us to our room. In reality, this was just a glorified sales pitch to try to get us to join one of their “tours” of the resort (aka – Vacation Club presentation). I don’t want to get too deep into that yet, because there is a whole section about it below. I will say though, that we spent a good 20-30 minutes with the concierge before we were able to actually get to our rooms. We did end up signing up for one of the presentations, mainly just to get to our room so that we could relax. Overall, the check-in experience was not positive for us. We understand that an all-inclusive resort does require some extra explanation, but in our opinion, it should never take nearly an hour to get checked-in and to the room. The staff was nice (although the concierge did apply a lot of pressure for the vacation club presentation), but the wait times were unacceptable. That is why I can only give a 2 out of 5 for our check-in experience. 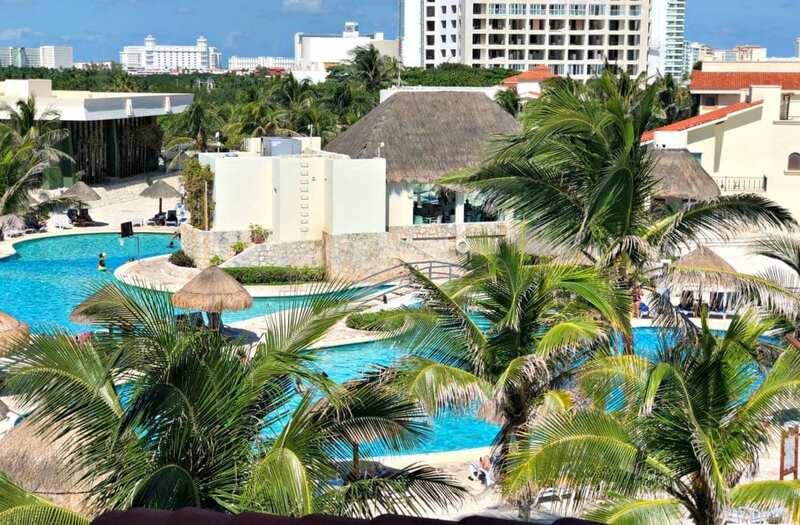 The Grand Park Royal Cancun Caribe has many different room options. You can check them all out here. We originally booked the Deluxe Ocean View room, which looked like a pretty good option. It would have an ocean view and was in the main building. The main building is not adult-only, so that is something to keep in mind if you are not traveling with children. 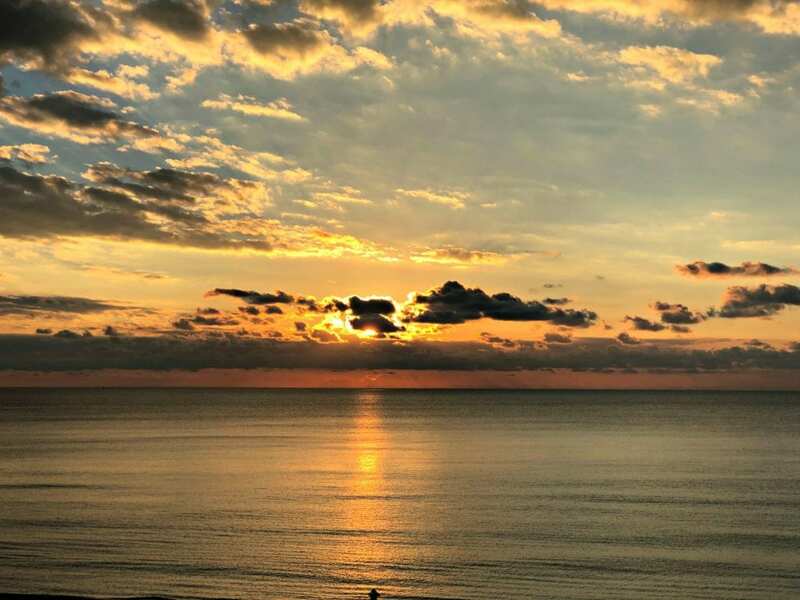 Breathtaking view of the sun rising from our Royal Tower suite. We probably would have been fine keeping our original room, but in the end, we decided that we wanted something a little bit more luxurious for our stay. During check-in, we were offered an upgrade (at a cost) to the Royal Tower Jacuzzi Suite Ocean Front. This room is about 70-80 square feet bigger than the Deluxe Ocean View room, and it had a Jacuzzi. In addition, those staying in the Royal Tower are assigned a “mayordomo” or “butler”, who is there to help with reservations and any other questions. This was actually a very big selling point for us. We just had to tell our mayordomo when we wanted to reserve anything at the resort, and she took care of it for us. For others staying at the resort, they have to go to the restaurant on their own and reserve it. It was nice not to have to worry about that at all. Our mayordomo was named Jessica, and we were extremely happy with her. She went above and beyond to explain everything to us and to ensure that we had a great stay. We also let them know that we were celebrating our anniversary, so they surprised us with a couple of special amenities. We came back to this surprise on the second day! The room itself was great. The view was amazing and it was so nice to be able to relax on the balcony while watching the waves rush up against the shore. View out the window from the Royal Tower suites. We had a couple of issues with the room that I do want to bring up. First, one of the sinks was not draining when we first go there. Since there were two sinks, it wasn’t a huge issue, and when we brought it up the next morning, it was fixed very quickly by the maintenance crew. The other issue arose on the second night. We were sleeping, and we started hearing a really loud “clapping” sound coming from the air conditioner. It sounded like something may have been loose and was banging around in the ceiling. After about 20 minutes, my husband just stood up and turned off the AC, and then turned it back on again. After that, we didn’t hear the sound again. The old “turn it off and back on again” apparently works for air conditioners too! Overall, we really enjoyed the room. The view was unforgettable, and it was very relaxing. There were a couple of minor issues, but I would still give the room a 12 out of 15. Book Your Room At The Grand Park Royal Cancun Caribe Today! One of the very bright spots of our stay at the Grand Park Royal Cancun Caribe was the food. There are some really great options, and since it is all-inclusive (with the exception of the Steak House, which I will discuss below), it is really easy to try all, or most, of the food. Dinner at the Prime Rib House on our last night. Cocay Restaurant. This is in the main building and is open for breakfast, lunch, and dinner. It is served buffet style and has different options each day. We tried this pretty much once a day at least when we stayed at the resort. The breakfast was by far our favorite. They had chilaquiles, which we love, apple pancakes, an omelet bar, eggs, fruits, and more! The lunch was good both times that we tried it, and we have no reason to believe it wouldn’t be good for dinner, although we didn’t have a chance to try that. El Mirador (Italian). We tried the Italian restaurant, called El Mirador, on our second night at the resort. The service was amazing and the food was delicious. My husband tried the traditional lasagna, and I tried the beef cannoli. Since this is an all-inclusive resort, we also ordered the ribeye steak and a pizza to share. Everything that we tried was amazing and I definitely recommend that you try this while you are there. El Oriental (Japanese). We had a very odd experience when we tried El Oriental restaurant. The night we went was “rodizio” night, and it was explained to us that they would come around with some appetizers and that we could eat all we wanted. Then, we were supposed to be served the main meat dishes as well. When we arrived, it seemed like none of the staff knew what they were doing. We heard them arguing with each other, and we were only provided a couple of appetizers before our plates were taken away. Next, they did bring us the kabobs, which tasted pretty good, but were definitely not filling. We ordered a second round of our non-alcoholic pina coladas, and they never arrived. We ended up leaving at that point because it just wasn’t a good experience overall. Our experience may have been an anomaly, but we were disappointed. La Concha (Seafood/Mexican Cuisine). We were really excited to try this restaurant, but unfortunately, we weren’t able to on this trip. We had a couple of all day trips planned to Chichen Itza and XCaret parks, so on those days were did not eat at the resort. We planned to eat at La Concha on our last night. Unfortunately, we were not aware that it wasn’t open on Sundays (the other restaurants are), so we didn’t get to try it. I heard great things about this place though, so you may want to check it out. Prime Rib House. This is the only restaurant on the property that is not included at no charge. It is a high-quality prime rib and lobster restaurant that you can reserve. The cost is pretty reasonable for what you get. It was 25 dollars each for the prime rib dinner, and you can upgrade to a prime rib and lobster dinner for 5 more dollars. My husband and I both opted for the prime rib, and it was delicious. The 25 dollars includes the salad bar, which had lots of options, the meat, the side (we chose the baked potato), and a fancy dessert. It also includes drinks. We weren’t sure if we wanted to do it, but since it was our last night and La Concha wasn’t available, we decided to give it a try. While it was delicious, there are plenty of other non-paid options that you will not be disappointed. El Jardin Snack Bar. This was a great find! We went to El Jardin Snack Bar on our first night, and discovered that they served about 5 or 6 different varieties of authentic street tacos. They had al pastor, chorizo, bistec, and alambre. We could not get enough of this little gem while we were at the resort. The tacos were amazing and really reminded us that we really were in Mexico! We went there three out of the five nights that we were at the resort. During the day they serve hot dogs, nachos, and hamburgers, which we didn’t try, but that looked pretty good as well. Cafe Sole. Cafe Sole is a small little cafe inside the main building, right near the lobby. It serves a variety of baked goods, sandwiches, and ice cream. We stopped by there for some pastries and an ice cream cone on multiple occasions, and everything was quick and good. Definitely recommended for a quick snack. Pizza Corner. This is one option that we did not have the chance to try. I wish we would have, but we just ran out of time. I have heard that it is pretty quick and the pizza is tasty, but I didn’t have a first-hand experience. Probably a good place to try! There are a variety of bars throughout the resort. My husband and I do not drink, so I cannot provide an opinion on any of the bars. That said, they always seems to be full and I have heard good things about them. There is a swim-up bar in one of the pools, and the people that took advantage of that seemed to be enjoying themselves. Overall, I will give the dining options at the Grand Park Royal Cancun Caribe a 14 out of 15. It was that good. This is one area where we were a little bit disappointed. When we stayed at a resort in Playa del Carmen, one of our favorite parts was the nightly entertainment. There were some amazing shows that we really enjoyed. During our check-in, the concierge told us that there were nightly shows here as well. He said that the first night there would be a comedy show. After we got settled in our room, we went out looking for it in the area that we were told. When we got there, there was a staff member sweeping the floor, and she said there was no show that night in there, but that we should check by the pool. We checked by the pool and there was nothing. When we went back to the original conference center, someone told us that there are no shows at all this week. We were really disappointed by that because we considered it part of the package that we had purchased. We checked back on the other nights, and there was never any show going on. There were a few other entertainment options, such as Bingo, and a volleyball court, but none of those activities really interested us. Fortunately, we were able to go on a few excursions that were very fun, so that made up for it a little bit. Overall, we were extremely disappointed in the lack of entertainment at the resort, and for that reason, I can only give this resort a 4 out of 10 for entertainment options. One of our favorite experiences on our honeymoon was doing a couples massage at the spa. 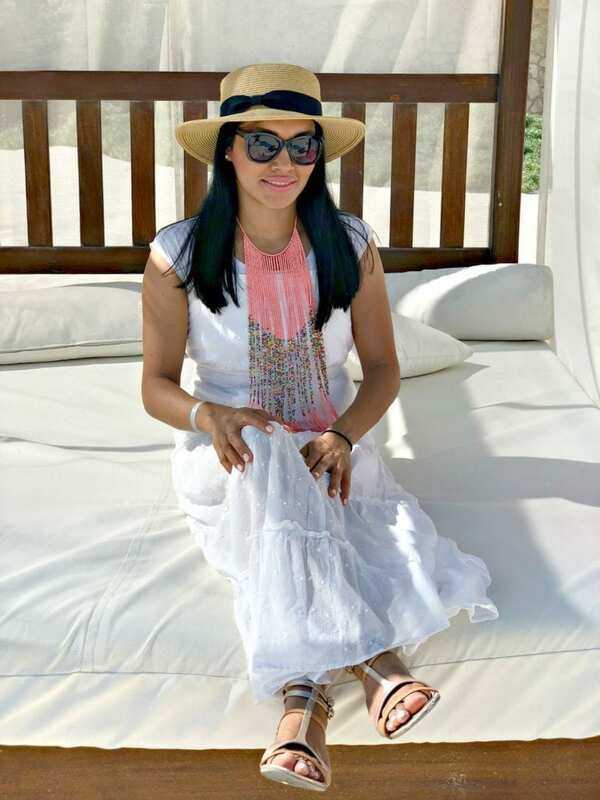 We were happy to find out that the Grand Park Royal Cancun Caribe also had a spa, and it was something that we definitely wanted to take advantage of. One of the discounts that we were provided for sitting through the vacation club presentation, was a credit for two free massages at the spa ($100 value). My wife chose the deep tissue massage, and I chose the Shiat-zu. We were very impressed with the whole experience. They started off by leading us each ot our respective changing areas, and then leading us into the room where we would receive our massages at the same time. Like most spas, the massage room had a very appealing scent and the masseuses did a great job. When we finished, we were told that we could use the sauna and steam rooms for as long as we would like. We took advantage of that for a few minutes and then left. Overall, this was a great, and very relaxing experience and I had zero complaints. I would definitely give the spa a 5 out of 5. Before booking this trip, we read multiple reviews online. Many of those reviews brought up the vacation club presentation, so we were prepared for the pitch. The vacation club was first presented to us by the concierge right after we checked in. We had asked whether we could book some activities through the resort. This gave the concierge the opportunity he was looking for. He immediately told us about some amazing discounts that he could provide for Chichen Itza and Experiencias Xcaret. It didn’t take long to realize that there was going to be a catch. When we asked, he told us, “in order to show my gratitude”, we want to invite you a breakfast and tour of the resort. He went on to say that in order to get the discounts, we would need to attend the breakfast. We knew that the breakfast and tour would actually be the vacation club presentation, and we told him the same. We said very clearly that we were not going to sign up for their vacation club, and that we didn’t want to waste anyone’s time. He told us that it didn’t matter and that it would be very low pressure. We are smart enough to realize that it would not be low pressure, but we did want the discounts. We hesitantly agreed to attend the breakfast, after he wrote down the discounts we would get. The concierge was quick to remind us that a requirement was for us to bring our credit card, because “they needed to see the brand” because they are sponsors of the presentation. Of course, we realized that the real reason is that they want to make sure that they can convince you to sign up and pay right then. We told him we knew the brand of our card and would tell him, but he still insisted that we had to bring the card. Later that night, we decided we didn’t want to waste our time or anyone else’s, so we called the front desk and told them that we would need to cancel the breakfast. They said that was fine, but that we needed to drop off the voucher by 12:00 PM the next day. We went and dropped it off at the concierge desk, and scurried away pretty quickly. Then, out of nowhere, the same concierge from the night before came chasing us down the hallways. He then proceeded to pressure us into going and doing the tour right then. He said, “I just got approval for two free massages and one free trip to Chichen Itza!” We told him that it sounded great, but that we really didn’t want to waste anybody’s time, because there was no way that we were going to sign up for the vacation club. He then admitted that it didn’t matter if we signed up or not because he would get credit just for signing us up. Again, we reluctantly agreed to go. From that point on, we were escorted to a nicely-furnished, air-conditioned room where we were greeted by a manager. We told him the same thing – that we were not interested, and that we were taking the tour solely for the discounts. He assured us that they just wanted to show us why it is a great idea, and then it would be a simple yes or no. To make a long story a little bit less long, it was NOT a simple yes or no. The man giving the tour was very nice and we know he was just doing his job. However, we were escorted into a large room with other people that were taking the tour. He presented the numbers, and we told him that we absolutely were not going to pay 8,500 dollars right now + 450 dollars per month for 6 years for this vacation club. We countered every argument he gave us and after about 5 “no’s”, he said he needed to go tell his manager that we weren’t interested. His manager then came over and proceeded to try to convince us, in a sometimes insulting manner, to sign up for a lower cost package. After another 5 “no’s”, we were transferred to one final person who was supposed to give us a survey. Of course, this turned into one more chance for them to try to sell an even lower package. Eventually, we got out of there and received our vouchers. Daniel trying to relax in a hammock after finally getting out of the vacation club presentation. This was not a pleasant experience. We knew that there would be pressure, but the level of pressure, especially after we made it abundantly clear that we were not interested, was over the top. If you are confident that you can say no and you don’t mind wasting 2-3 hours (our’s didn’t even have the breakfast, and it still took over 2 hours), you might want to do this. However, make sure you get as much out of them as possible and get it in writing. I am giving this 3 out of 10 points, because the actual salesperson that gave the tour was nice, and because we did get some good vouchers. It is hard to go wrong in the hotel zone at Cancun. The entire area is beautiful with great access to the beach. It is a relatively short (about 15-25 minutes) trip from the airport to this resort. This resort isn’t one of the first few hotels, but it is only about half-way through the hotel zone, so it is a good location. 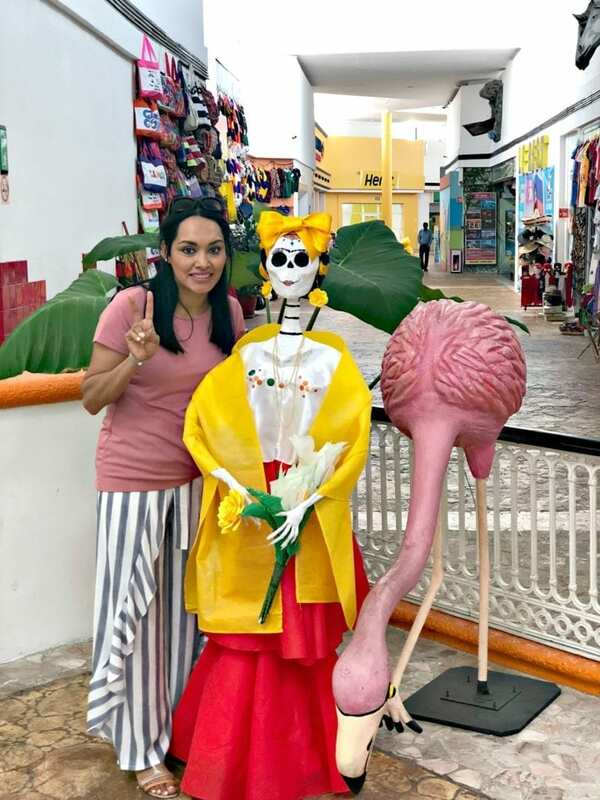 We also were pleased to find that there were a couple of “plazas” within walking distance where we were able to go and get some souvenirs that were much more affordable than the store inside the resort. Just make sure that you go to a few different stores because the prices can vary based on what you look like and how well you speak Spanish. Most of the people assumed my husband didn’t speak Spanish, but once he started negotiating with them in Spanish, the prices dropped pretty quickly! At the Plaza Flamingo getting some last minute souvenirs. The weather was amazing while we were there, and it was really just a great, relatively quiet and peaceful location. The only reason I am docking this a couple of points is that it would have been nice to be a little bit closer to the start of the hotel zone and because the traffic outside of the resorts is pretty crazy. There were a couple of times when we were walking to the plaza where we felt very unsafe because of the speed of the cars that were driving by. Overall, I give the location an 8 out of 10. 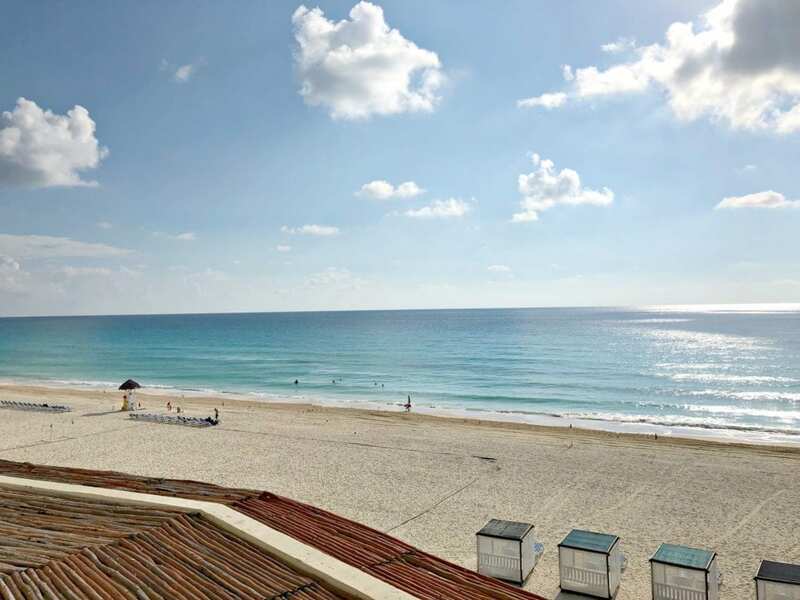 One of the main draws to Cancun is its amazing beaches. We hadn’t been to the beach for years before this trip, so we were pretty excited to get back. Fortunately, the beach at the Grand Park Royal Cancun Caribe didn’t disappoint. As you can see in some of these pictures, the water was stunning and the beach was great. We had so many other activities planned during the week, that we didn’t spend too much time at the beach. That said, we did go down there on two occasions during our stay. 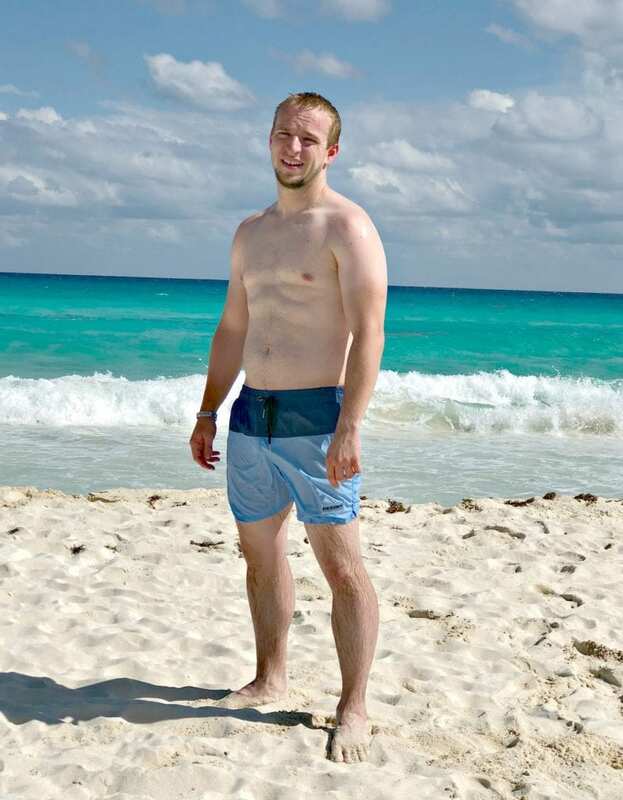 Daniel on the beach – nice farmer’s tan! Daniel swimming in the ocean – kind of. The first time we went to the beach was on a day when there was a ton of seaweed for some reason. That did make it a little bit less enjoyable, but it was still relaxing nonetheless. Lots of seaweed on the first day at the beach. 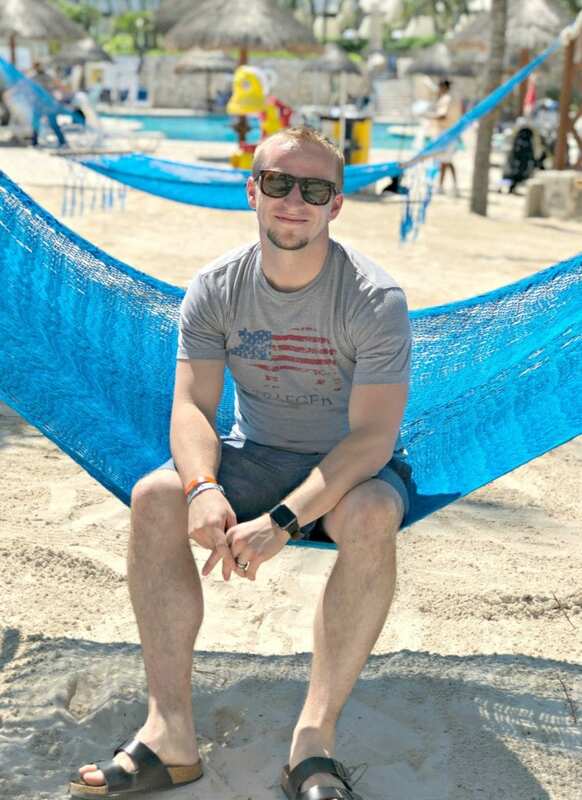 On our last day at the resort, we reserved a canopy (a perk of the Royal Tower rooms), and were able to spend quite a bit of time down there just relaxing and spending time on the beach. 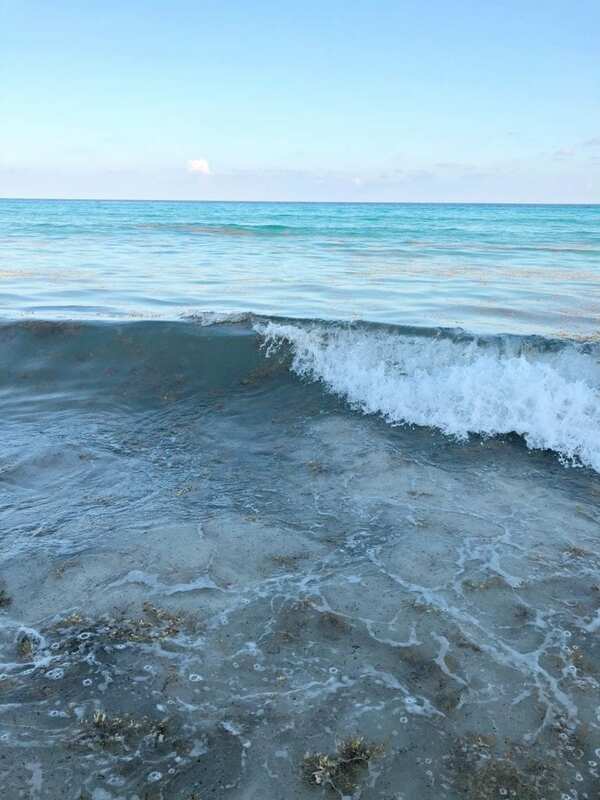 That day, there was no seaweed, and the waves were bigger than normal. It was so fun and we really enjoyed it. Charbel relaxing in the beach canopy. Charbel having fun on the beach. With respect to the pools, we really only spent time in one of them. There are two main pools. The first pool runs in the main section of the resort and has plenty of space. The second one is over by the Royal Tower rooms and is adult only with a swim-up bar. We only went to the pool once, but it was pretty nice. It was an “edgeless” pool, so the water just flowed seamlessly over the edge. Since we don’t drink alcohol, we didn’t spend any time a the bar and cannot provide any rating there. 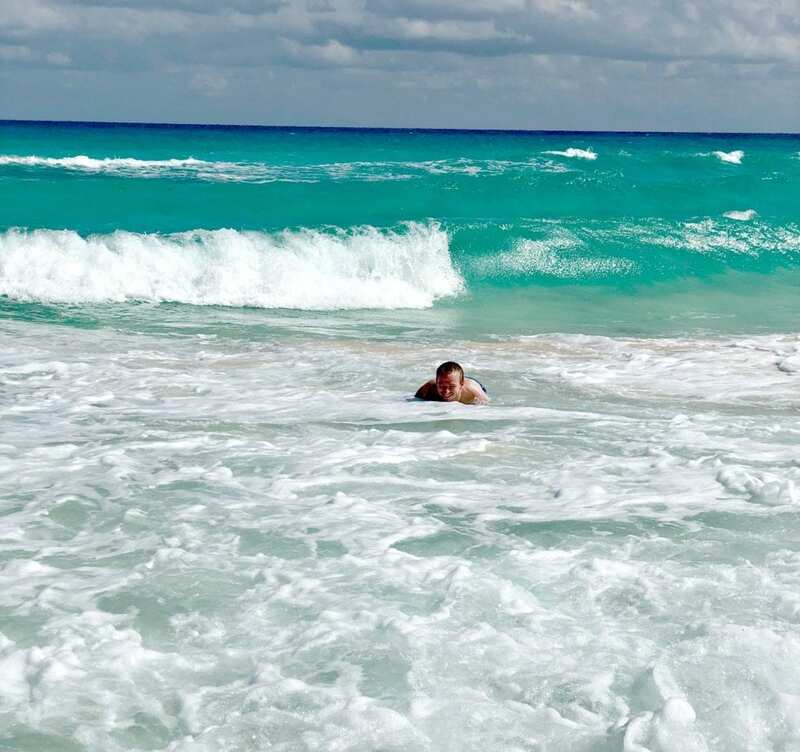 Overall, I would give the beach and pools at the Grand Park Royal Cancun Caribe an 8 out of 10, because the seaweed was kind of disappointing on one day. Overall, we had a wonderful time on this trip. We spent two full days away from the resort at Chichen Itza and XCaret Parques, so that had a lot to do with our amazing experience. That said, the resort was good overall. I am not going to say that it was the best resort, but it did meet our needs for the most part. We were really disappointed in the lack of on-site entertainment and with the vacation club presentation, and those are the main reasons for this resort not receiving a higher score. I definitely would recommend this resort, but make sure you go prepared and don’t hesitate to look for better options. I can say with confidence that you will have a good time, but there may be somewhere that is better for you. After adding all of the scores together, the final score that My Latina Table gives to the Grand Park Royal Cancun Caribe is 56 out of 80 (70%). Check out and compare other resorts located in Cancun here! If you have gone to the Grand Park Royal Cancun Caribe, what did you like or not like about it? Was your experience the same? Let us know in the comments below!